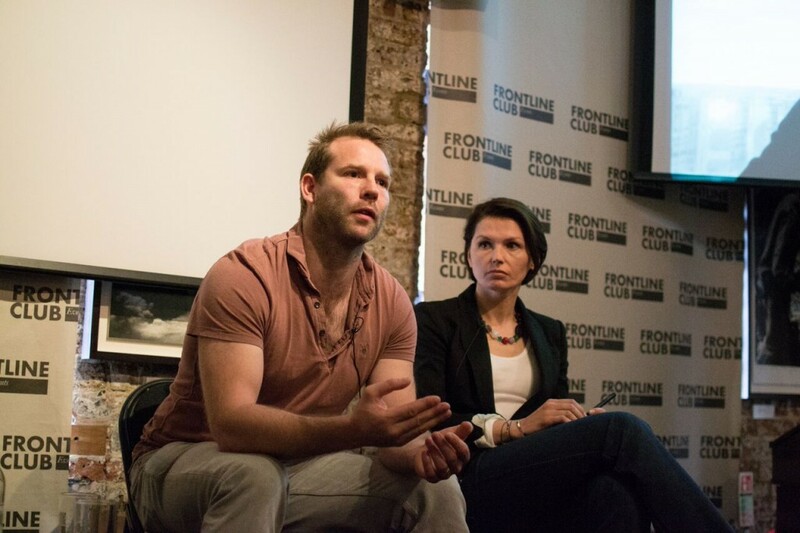 As part of the Documenting Ukraine festival held on Saturday 17 and Sunday 18 May in partnership with Open City Docs and GRAD, the Frontline Club screened the UK premiere of Anthony Butts’ work in progress: The Curious Tale of a Handmade Country. With astonishing access, Butts followed and filmed Ukrainian rebels in the east of the country as they attempted to establish the Donetsk People’s Republic. After the screening, Butts was joined by journalists Nataliya Gumenyuk and Oliver Carroll and Chatham House fellow Orysia Lutsevych for an in-depth discussion. The conversation touched upon economic grievances, propaganda and the escalation of the conflict.The first question from an audience member was on how Butts succeeded in gaining such impressive and unfettered access to a world that was reluctant to welcome journalists, and feared misrepresentation by the media. “First off, I said that I was making a big documentary about the creation of the country, so that kind of appealed to people’s egos,” said Butts, adding that being a documentary filmmaker awarded him a more privileged identity than that of a reporter. He built trust with the key figures in his documentary by finding common ground. The film provided a snapshot of a unique period of time. Carroll, who was talking to the Frontline Club audience via Skype from Donetsk, remembered the conflicting atmospheres. The rebels had a high level of support in the region, Carroll explained. “A lot of people genuinely support the idea of this Luhansk, Donetsk People’s Republic, and in a sort of anti-Kiev, self-identity, self-fulfilment type of way. And I think that’s increasing,” he said. Those who did not feel pulled by the prospects of self-determination, Carroll said, were pushed “for right or wrong” by the belief that Ukraine was shelling their cities. The Euromaidan protests held similar goals to those initial aims of the Donetsk People’s Republic. “The same economic problems were in Odesssa, in Western Ukraine, in many other regions which hadn’t been heard by the government in 25 years,” said Gumenyuk. However, the region was already relatively politically disenfranchised in Kiev before the events in Euromaidan and, as Carroll explained, Russia seized the opportunity to exploit this existing divide. The film also commented on the influence of Russian state television on the protests, yet Lutsevych told the audience of other ways that propaganda made its way across the border. On one visit to Ukraine, her translator told Lutsevych that Russian DJs touring Eastern Ukraine were warning their audiences of threats of fascism from Kiev. “They’re coming with their popular concerts and trying to say these kinds of things to people,” she said. Lutsevych spoke out about the “dangerous” way in which Russia was “manipulating millions of people” into the current conflict, citing evidence that the Kremlin had plans to stoke a rebellion even before Euromaidan started. However, other members of the panel put the cause of conflict squarely down to Russian intervention in the country. Importantly for Lutsevych, there was no existing internal conflict or civil war within Ukraine before Russia began to intervene. “I think this is even more scary when you think how easily you can create these artificial divisions,” she said. 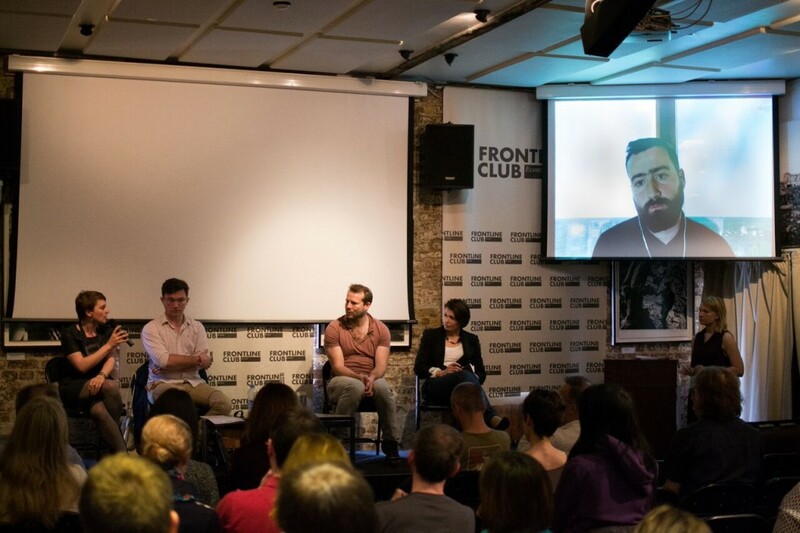 On Saturday 16 May, the Frontline Club held a special screening of shorts and clips reflecting on the Euromaidan movement in Ukraine as part of the two-day Documenting Ukraine festival. The short films – extracts from the longer work Euromaidan. Rough Cut – trace the efforts of a group of Ukrainian filmmakers who documenting several months of civil unrest, beginning in Autumn 2013 and culminating in the resignation of President Yanukovych in February 2014. The resulting clips form a mosaic of images and moments which, put together, allow a powerful insight into life on the Maidan barricades. The screening began with the short film Lenin’s Teeth, in which activists tear down a statue of Lenin during Maidan protests in Kiev in December 2013. Then followed filmmaker Roman Bondarchuk‘s short Search for a Leader, showing discussions between activists as they attempt to self-organise which trapped in a police cordon on a bitterly cold winter’s night. All Things Ablaze followed, which documents the violent struggles between police and activists in the weeks preceding Yanukovych’s resignation, in which flames, gunshots, molotov cocktails and bloodshed are regular features. The following discussion with filmmakers and academics touched upon the challenges faced by the filmmakers, as well as their motivations in documenting the Maidan protests.